Can we see Madrid properly in just 3 days? What are the must see places and what can we skip? Will we have time to go for a day trip also? We cannot spare more than 3 days for Madrid. Go past the main museums and plazas for further history and art of Madrid. Explore fashion and transportation. Get to know the literary history of the city’s most famous authors. Explore religion that still thrives today and get out of the Madrid center into fashionable, trendy neighborhoods full of locals. The Royal Palace of Madrid should already be on your itinerary for any amount of time in Madrid, even for a day's visit. As should Plaza Mayor and the Puerta del Sol. But now, with three days on your hands, you can go further than that into different aspects of historical Madrid. Head to Madrid’s literary quarter El Barrio de las Letras, where the streets are paved with quotes from the Spanish greats. Here you’ll find the church of San Ildefonso which is the final resting place of Miguel de Cervantes, the author of Don Quixote. And nearby is Casa-Museo de Lope de Vega the home of Lope de Vega, a main player in the Spanish Golden Century of Baroque Literature. His home turned museum is a perfectly preserved picture of what life was like in 17th century Madrid which can be viewed only by guided tour. Try and hit this area on the first Saturday of any month when all the book sellers come out of their shops lining the streets with special deals. Make your way then to two monasteries; Monasterio de las Descalzas Reales, a working monastery of which only parts can be visited. Tours are almost exclusively in Spanish but the art doesn’t usually need much translating. Second is Monastery of La Encarnación, from the 1600’s, is just next to The Royal Palace, with a passageway connecting the two that allowed royals to gain access. Again, the monastery remains in working order but that nuns probably won’t choose to be visible during your visit. On a two-day itinerary I give my guests options of three possible museums: Real Academia de Bellas Artes de San Fernando, Museo Thyssen-Bornemisza and Museo Nacional del Prado. With 3 days in Madrid, if you feel you still haven’t gotten enough in the way of traditional museums you can add Museo Nacional Centro de Arte Reina Sofía, Spain’s national museum of 20th century art. But, if you’ve had your fill of traditional art galleries you’ve still got plenty to see. Fashion lovers should head to Museo del Traje (Museum of fashion) where over 160,000 pieces of historical fashion on photography are on display. It’s a bit out of the city center but if it’s your style, then make the time. A fun spot for everybody is Estación de Chamberí, again a bit away from el centro, it can be reached by metro, though not to the spot itself, despite the fact that it is in fact a metro station. A 1920’s metro station. One of the original eight stations in Madrid it was opened as a museum in 2008. Start in Chueca, which is still fairly central but gets you away from the tourists and amongst the locals. Chueca is the center of Madrid’s gay community as well as some of its most fashionable shops, bars and restaurants. A great place to eat-check out the 3-floor Mercado de San Antón, drink-the mercado’s rooftop bar, people watch-one of the world’s largest gay pride parades or shoe shop-calle Agusto Figueroa, entirely shoe shops. For something on the posher side of things head to Salamanca neighborhood where shoe prices are higher and bars posher. But explore and you’ll certainly find some mom and pop treasures. El Teatro Real offers opera, dance and concerts throughout the year. Check the schedule and book your tickets to ensure you get a chance to experience a performance inside the 1800’s opera building. Perhaps the most important performances in Madrid take place at Santiago Bernabéu Stadium by men clad in white t-shirts. Official Real Madrid games run from late August through May but you will need to pay a lot of attention and plan well in advance to secure tickets (at any reasonable price!). Madrid is also a huge centre for Flamenco; if you are not going Andalusia on this trip you should watch a show in Madrid. If you miss out on tickets to a Real Madrid game you can still experience Spanish football with a guided tour of the stadium. You’ll have access to a lot more than if you were watching a game including the players dressing room, the tunnels, dugouts, club rooms and panoramic views of the stadium. Tours take an hour and half and run every day with limited times on match days. Adult tickets are €25, a great deal less than match tickets! Devour Madrid offers a variety of foodie tours for tapa and wine lovers alike. Try their most popular tour the ‘Ultimate Spanish Cuisine Tour’ which lasts 3.5-4 hours and costs €85 for an adult. On it you’ll have a try of 12 or more dishes at 8 or more different locations. You’ll also have plenty to drink and get to go behind the kitchen doors at one of Madrid’s oldest restaurants. The literary neighborhood, which we’ve recommended visiting for its history, can also be seen on a guided tour. You’ll get a bit more context about the writers who made the neighborhood so popular. A hand-held fan is not only an excellent souvenir but also very useful to pack in your bag during the summertime. Give it a wave to cool off and you’ll look more like a local already. Saffron is another excellent, useful souvenir. Prices for this rare spice can run quite high outside of the region. It’s an excellent addition to many dishes and is what’s used to give Paella its yellowish color. If home is outside of the E.U. be sure to double check regulations on bringing spices back into your country but generally anything package sealed shouldn’t be a problem. Or head for the leather shops if you’re looking to bring something back that’s a bit more useful and less of a souvenir. Prices are lower than what you may be used to and quality remains high. Jackets, wallets, belts, gloves or bags are all excellent options. Take a look at Corte Inglés, the large department store, for any of these items. You won’t find kitschy souvenirs there, many of the locals shop there so prices won’t be aimed at foreigners. Madrid is a big city with many attractions; with 3 days you’ll be able to go at a better pace while still packing a lot in. Ideally keep a day extra for a trip to Toledo. How many days in Madrid is enough? - A single Madrid public transport ticket costs €1.50-€2 depending on which zones you use. - A 3-day pass is €18.40 and can only be used for one person. - And a 10 trip multi-person metros pass costs under €13. So think about how much you will need to use transport, this will depend a lot on where you are staying and how much you are willing to walk. You’ll have to take more than 10 rides over your 3 days to make the pass a good option. The Madrid Card for three day costs €67. Take a close look at the list of where you gain entry before deciding if this card is worth the investment. Yes, it’s always a good idea to book what you can in advance. In Madrid the Prado Museum as well as the Royal Palace should be your top priority bookings leaving you with some flexibility as to when you’d like to get to the other attractions. Chueca, as we’ve discussed is also a wonderful, hip neighborhood. There’s little reason not to stay here. Again, you won’t be far from city center, but perhaps far enough to be in the real Madrid. Try Only You Boutique Hotel. Visit local markets. Be sure to leave your diets at home and scour the food markets-Mercado San Miguel in centro and Mercado de San Antón in Chueca for snacks, tapas and picnic offerings. Some of Madrid’s local food offerings include: Cocodio Madrileño or Madrid stew, a cold weather specialty that simmers for hours. It’s a combination of vegetables, chickpeas, chorizo and pork, all of which is usually served separately. Get it at Malacatin in centro. After something simpler? Try huevos rotos (broken eggs), fried potatoes topped with over easy eggs and a sprinkling of salt. It is as simply delicious as it sounds. Get it on your way out of the Royal Palace at El Mollete. Breakfast in Spain is usually fairly light. A cup of coffee and tostada con tomate a toasted baguette and crushed tomato to top it with is a classic. On your way to Puerta del Sol stop at Venta el Buscón to give it a try. Don't leave without experiencing Madrid nightlife; it doesn’t have a special day of the week. Though the weekends may be more packed with locals any night can see you through to morning. This may come as a surprise but the literary quarter has a wonderful nightlife that suits all ages. The pedestrian only streets come alive with all types of music. Café central is a great jazz club with daily shows at 9PM and advanced bookings available. There’s plenty to do here with kids, start by increasing your time in the parks. Casa de campo is home to a zoo and aquarium which can be great way to keep the kids happy. The stadium tour is a great option for kids a bit older. On a rainy-day head to the Museo de America which has interactive kids exhibits. Temple of Debod, is a magical spot come sunset. Go for a picnic in one the parks, stock up at a mercado, pack a bottle of bubbly and a blanket to create the perfect date. Or get dressed up for a posher date and buy tickets to a show at Teatro Real. A perfectly romantic evening on an exceptional budget is to see a film at Cine Dore. The theatre is perfectly quaint and tickets are only €2.50. Can you do day trips from Madrid? Realistically three days still isn’t enough to head out of town for any amount of time. Four days in the city would be great, then bump that up to five or six days to fit a day trip in. Do not worry if you have only 3 days in Madrid; you still have enough time to get a good Madrid experience. Make sure to see and do the following to appreciate the essence of Madrid. The Madrid Royal Palace is a must see even on a 1 day trip to Madrid. It takes only 2 hours at most even with the guided tour. Madrid is best known for its Art Walk (Paseo del Arte), the one-kilometre boulevard which houses three world-class museums –The Prado Museum, Thyssen-Bornemisza Museum, and Reina Sofia National Museum. On a short visit, do not attempt to visit all the three museums. Visiting all 3 museums of the Art Walk will be a museum overload on a 3-day trip. What’s more, you will spend an entire day or more just on museums. Unless you are a museum junkie, it is best to focus on the Prado. If you want to add one more, choose Reina Sofia for Modern art, or Thyssen if you want to learn Classical art fundamentals. No need to buy the Art Walk pass; just look out for free entry timings. Reina Sofia is generous with its free hours. 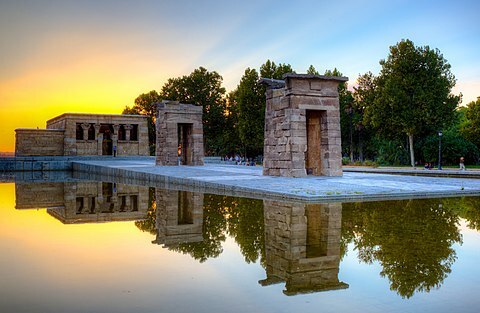 Do not miss this unique Madrid experience of an Egyptian Temple in a beautiful sunset setting. It is centrally located, so you have no excuse to miss this. Head to Mercado San Miguel for a gourmet tapas experience in a historic building. Mercado San Miguel is also centrally located. Madrid nightlife is buzzing; there is no excuse to skip this even on a short trip to Madrid. The central area of Sol and Grand Via is most convenient, but there are many districts famous for nightlife in Madrid. Toledo is a must visit even if it takes a day out of your 3 day visit to Madrid. It will give you a fantastic insight into the history of the region, right until the modern times of Franco. There is enough in Toledo to keep you occupied for a day. Visit Bernabeu stadium, home to Real Madrid. You can easily take the self guided tour of the stadium and the trophy room. A must do for football fans. Skipping the day trip – It is tempting to think that only 3 days for Madrid city will not be enough to squeeze in a day trip. Believe me, if you plan well you can easily make it. Buying a travel pass – Madrid is a walking city; there is no benefit of buying a travel pass especially on a short 3 days trip. This post gives a run down of all discount cards available for tourists in Madrid. Buying a Madrid Card – I will never recommend this even on a longer trip because it is just not worth the cost. Buying Art Walk pass – You will not have the time to do justice to all 3 major museums; so save your money and just buy Prado tickets, in advance. As this post says, be smart! Do not buy art walk pass in advance. Staying away from the centre – On a longer trip it does not matter where you stay in Madrid. But with a short trip, save the travel time and stay centrally instead. Flamenco and Tapas in Madrid - If you are also headed to Andalusia during the same trip, skip watching a flamenco performance in Madrid. Flamenco is best experienced in Andalusia, where it was born. Similarly, If you were planning to spend an entire evening devoted to Tapas, save that for Andalusia too. I suggest to first read this helpful post that captures the spirit of Madrid on a 4-day visit. From the plan, you just need to skip a few items.